Slow-cooked beef and pork ragù with red wine and oregano, layered with egg pasta and topped with our creamy béchamel sauce. Preheat your oven to 200°C/180°C fan/gas mark 6. (Be careful not to grill by mistake!). Remove the film but leave the lasagne in its wooden tray*. Place on a baking tray in the centre of the oven and cook for 35 minutes. Egg pasta (durum wheat semolina, water, pasteurised free-range egg), tomatoes, cream (milk), milk, red wine, British beef (8%), Cheddar cheese (milk), smoked bacon (pork, water, salt, preservatives: sodium nitrate, sodium nitrite, potassium nitrate, antioxidant sodium ascorbate*), British pork (5%), onions, tomato purée, water, carrots, wheat flour, mozzarella cheese (milk), celery, sunflower oil, butter (milk), balsamic vinegar, chicken liver, cornflour, beef stock (British beef, yeast extract, salt, tomato purée, molasses, lemon juice concentrate, onion powder), garlic purée, fresh parsley, salt, oregano, sugar, black pepper, star anise, nutmeg, white pepper. *Don’t worry, this is part of the traditional curing method of smoked bacon. 4. To assemble the salad, arrange the ingredients in layers; first a layer of rocket leaves, then onions and then flakes of parmesan. Sprinkle with the dressing as you go. Continue like this, finishing off with a layer of parmesan, and serve with Charlie Bigham’s Lasagne and a loaf of warm ciabatta straight from the oven. 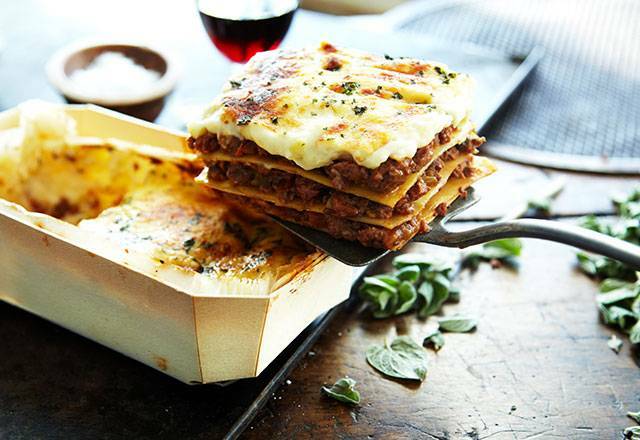 A meaty lasagne and a glass of red wine is a classic combo. We’d plump for a medium-bodied Italian red, like chianti, or a cabernet sauvignon.